BJORA Group AB offers it’s customers a high class bonded warehouse of about 11 900 square meters very near the center of the city. Inside as well as outside storage is offered as well as storage and handling of cargo under temperature control. We do operate the warehouse with own staff and handle all types of cargo from Iron and Steel products, Paper in reels as well as ordinary goods under the sector General Cargo. 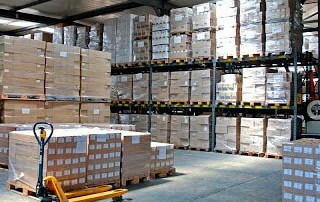 The warehouse is a complete CFS-station, (Cargo Freight Station). Lifting capacity 22 metric tons in tandem lifts. Special equipment such as clamp-trucks is also found in our fleet of forklift trucks. Direct computer connection to Swedish and European customs authorities make our work easier when reporting the commodities on imports and exports as well as what is in storage.